The north eastern part of Buriton parish, bounded by Petersfield to the north and over the county boundary to the east by Harting, has long been known as Nursted. Most of this note refers to Nursted House and Nursted Farm, although there is some information about a possible ‘Parish Pest House’ where people suffering from the plague might have been taken. An early reference to Nursted has been found in the reign of Henry II, when the monks of Durford Abbey are mentioned as having tilled the terraces of Nursted. It is believed that there was a large house at Nursted in Elizabethan times but that this burnt down. The present Nursted House is thought to have been built around 1690, incorporating parts of an earlier building. Nursted House was subsequently the seat of the Hugonin family whose memorials are in Buriton church. In 1751 Francis Lewis Hugonin was resident in the house; in 1816 Francis Hugonin; in 1838 James John Hugonin; and in 1863 Francis James Hugonin. It was in this year that the estate was sold to Samuel Rowe of Llanycefin, Flintshire for £40,000. He died in 1866 and his nephew, John Rowe Bennion, inherited the estate which then remained in the Bennion family for about a hundred years. In the same sale document, Nursted House itself was described as being a commodious family mansion containing spacious entrance hall, dining and drawing rooms, a library, six well-proportioned principal bedrooms, two dressing rooms, and seven secondary and servants bedrooms. The ‘domestic offices’ consisted of a butler’s pantry and adjacent store room; a stone-paved kitchen with ‘Flavel’s Patent Leamington kitchener’, hot plates, charcoal stoves and dresser; a scullery; a housekeeper’s room fitted with cupboards and presses; and capital wine and beer cellars. ‘Out Offices’ included a laundry, fruit-room, shoe-house, wash-house, bake-house, pump-house, brew-house, dairy, wood-house, gun room and coal-house. There were also ‘capital coach-houses and stabling, and pleasure grounds laid out with great taste and ornamented with tulip and other rare trees and flowering shrubs’. A ‘capital trout stream’ was included in the estate and the grounds also contained ‘a large turfed enclosure for fowls and a range of four poultry houses, with a servants WC in the shrubbery’! 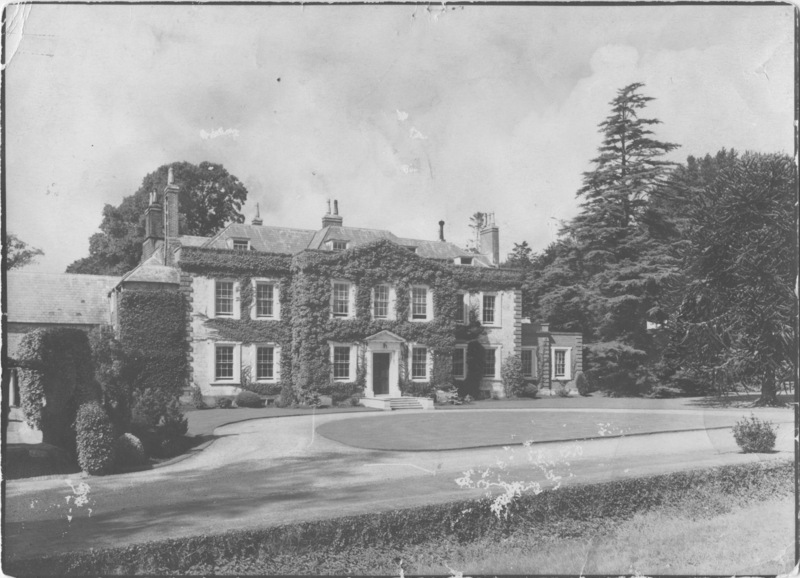 Research by Caroline Maxwell Hutchings shows that one of her ancestors, a William Maxwell, obtained a lease of Nursted Farm in the early 1760s from Edward Gibbon who owned the manor. The Maxwell family had settled in the Harting area earlier in the century and were yeoman farmers – an intermediate class between the gentry and the artisans and labourers. Nursted Farm was still leased by the Maxwell family a hundred years later in 1861. The 1841 census shows that the family had two female and two men servants and farmed 325 acres with a bailiff and 18 labourers. 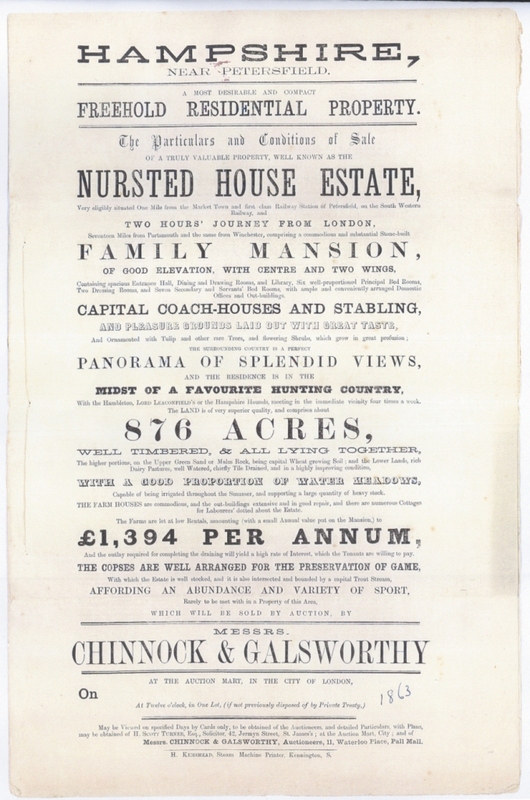 In 1863, when the farm was included in the sale of the Nursted Estate, the occupier was recorded as a Wm Geo Goodeve. William Goodeve and his family were still in residence at the time of the 1871 and 1881 censuses, but by 1891 John and Mary Pope were the tenant farmers. It was in 1897 that the Bray family moved in as tenants and a special Centenary Celebration Choral Evensong service was held in St. Mary’s Church, Buriton, in October 1997 to mark 100 years of residence by the family. John Rowe Bennion, who inherited the whole of the Nursted Estate in 1866, aged 30, appears to have been very enterprising and enlarged the estate by adding Old Ditcham and Little Heath farms. The 1863 sale document does not suggest that there any cottages at Binden or the Keepers Cottage at Nursted Rocks at that time. It is, therefore, likely that Mr Bennion had these houses built in the latter part of the nineteenth century. Census records suggest that they were all built between 1871 and 1881. Nursted Lodge has the date 1880 indicated on a gable. 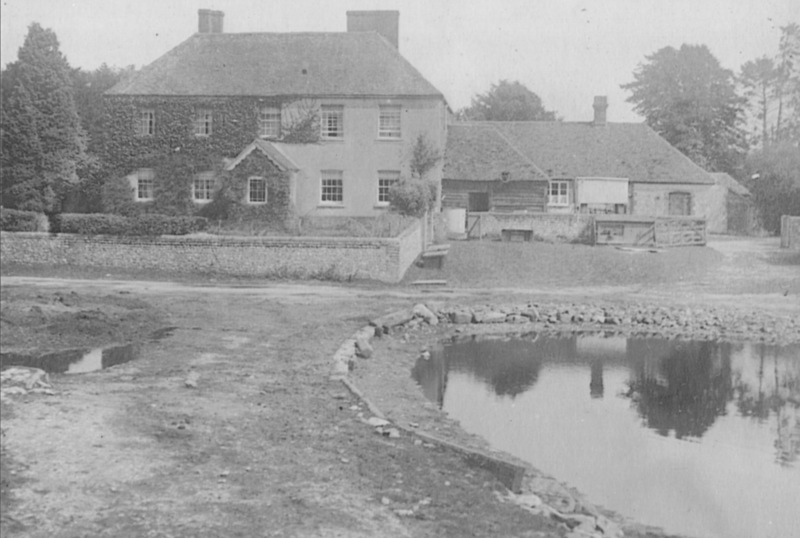 Mr Bennion also bought land in Petersfield and built a number of large houses near the lake and along The Avenue. He lived to the ripe old age of 91, dying in 1927. His only grandchild, Mrs Peggy Lumsden-Cooke who now lives in London, can recall travelling with her grandparents by horse and trap – apparently Mr Bennion was not interested in acquiring a motor car. His coachman, a Mr Holland who lived at Nursted Lodge, would dress in a royal blue coat with striped blue britches and would wear the family crest on his hat. In addition to the coachman, Mrs Lumsden-Cooke recalls that there were about fifteen people working in the household: indoor servants, gardeners, a full-time carpenter and someone to look after a number of pigs, cows and horses. An old chapel next to Nursted House had been converted into a dairy and stables, possibly even before her grandfather’s time and there were pig sties and cattle sheds in the grounds. Mrs Edwards described Mrs Bennion as a tiny, very religious woman who took prayers every morning at 9am prompt. She also officiated at Sunday school. The family gave generously to the church with the central heating being presented by Mr Bennion in 1896 and Mrs Bennion donating the organ in 1897. The couple provided the church clock in 1906. At the turn of the century, the Nursted area still had very limited water supplies. Rainwater used to be stored in a range of tanks above and below ground. Fresh water was drawn from wells, pumped by engines, a windmill or hydraulic ram. It is not actually that long ago that local farmworkers would return to a lamp- or candle-lit cottage at the end of an exhausting day to find that they still had to draw their water for all their domestic needs. The good old days ? When Mr JR Bennion died in 1927, his eldest son Dr Menlove Bennion inherited the estate. At the time he had been a doctor in Kent but he stopped practising and moved to Nursted. During the war years he acted as an honorary doctor for Buriton. Nursted House was supplied with water pumped from a hydraulic ram which was situated below the spring line in the field north-east of the house. This supply only became redundant in the early 1970s when Nursted House began to be supplied with mains water. This part of the parish was one of the last to benefit from mains water. The occupants of Binden Cottages had to get all their water from their well until 1936 when water was piped to their cottages. For quite a few years, the residents of Nursted Cottages had to collect all their drinking water from Binden Cottages as their well had been condemned for drinking purposes and they did not receive a mains supply until after the second world war. Properties located in the Nursted Rocks part of the estate and Old Ditcham Farm were served by a new pipe line laid in 1949. This connected them to the Mid Southern Water Company’s pipe which, until then, terminated at Buriton House. By 1963 Nursted Farm was also connected to this water supply system. Hitherto, Nursted Farm had used wells: one near the farm house and yard and the other at Binden. Water from this well at Binden was initially pumped by a small windmill but this blew down in a gale in the 1920s and from then, until this part of the farm was connected to the mains supply in 1975, a petrol engine was used to drive the pump at the well head. Bolinge Hill Farm was also dependant on well water, a windmill-powered pump and a hydraulic ram to supply all the farm’s water requirements until the arrival of mains water supplies in the 1950s. At Nursted Farm, the original farm building complex near the farm house included stables for six or seven horses, two large barns, two four-bay cart sheds and a granary built on staddle stones. These traditional style farm buildings all date from the early to middle eighteenth century. The nineteenth century saw the construction of a range of housing for cattle and the addition of another stable with trap-house adjoining. Nearby, a small piggery was also built. All of these buildings became progressively incompatible for use with twentieth century farming practices and the inexorable advance of machine replacing man- and horse-power. From 1990 these buildings passed into separate ownership, culminating in the completion of restoration and conversion works during 2000/2001 to form another large country dwelling. The Nursted Estate had begun to fragment in the 1970s, firstly with the sale of some of the former agricultural cottages and subsequently, after Dr Bennion’s death in 1973, the remaining properties were sold either to sitting tenants or to private residential buyers. Some of the farm equipment is stored at the Weald and Downland Museum in Singleton near Chichester. Trinity College Cambridge bought the holdings of Heath and Nursted farms but subsequently the Caine and Bray families have been able to purchase the major portions of their farms. There are still dairy herds at Stanbridge and Heath Farms, but cereal production is now an important part of the local farming economy. For nearly forty years (between 1930 and 1970) there was a poultry breeding and commercial egg production enterprise at Nursted Farm and more recently, in 1983, a sheep flock has been introduced. A Parish Pest House ? A former vicar of the parish, the Reverend Peter Gallup, suggested in 1973 that Uphill Farm Cottage in Nursted was possibly built to serve as a ‘Pest House’ for the parish – a place where anyone suffering from any fatal infectious disease (or pestilence) could be removed. Rev. Gallup felt that the cottage was unlikely to have been built as a farm cottage because it is too large and there are no adjacent farm buildings. In addition, the building resembles Pest Houses in East and West Meon, it lies on the north east side of the parish and it is stands apart from, rather than facing, the road – all, apparently, common features of other Pest Houses. He estimated that the cottage was built between 1780 and 1785 which would fit with the period of construction of Pest Houses in other parishes. Up until about 1720, if anyone was suspected of having the plague or any other serious disease, the door of their house would be shut fast (with healthy and sick inhabitants inside) until a full month after the last death or the recovery of the inmates. In 1720, a Dr Richard Mead of St. Thomas’s Hospital published his “Short Discourse Concerning Pestilential Contagion”. He condemned the shutting up of infected houses with their inmates as both futile and cruel. He advocated that as soon as an outbreak was suspected in an area, a Council of Health should be formed whose duty it would be to remove the sick to some three or four miles outside the boundaries. They should also cleanse those who had had contact with the sick. All this was to be done at the public expense. The fact that public expense was now invoked made it more possible for adequate buildings to be built and records indicate that many Parish Pest Houses operated in country districts from around 1780 to 1834. Do you know any more about Nursted ? Do you know any more about this subject or about other buildings in Nursted ? Do you know anything about any of the people who have lived at Nursted in the past ?